U2 lead singer Bono will be the speaker at the University of Pennsylvania's 248th graduation ceremonies on May 17. "With his tireless efforts and use of his celebrity to remind us of our moral duties as citizens of the globe, Bono has been a powerful force for change, galvanizing the action of presidents, countries and the general public," Judith Rodin, president of the prestigious Ivy League university said in a statement Monday. 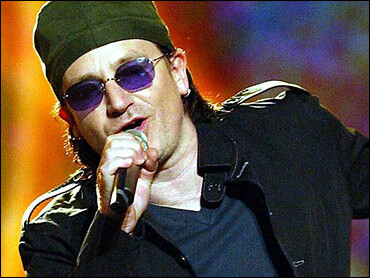 Bono was nominated for the Nobel Peace Prize last year for his work to relieve Third World debt and promote AIDS awareness. He is the founder of Debt AIDS Trade Africa, which works with religious groups concerned with global disease and hunger issues. Bono will receive an honorary Doctor of Laws degree from the university. Born in Dublin in 1960, Bono formed U2 with high school friends. The band has won seven Grammy awards and sold more than 100 million albums over the past 20 years. Other Penn honorary degree recipients will include cell and molecular biologist Elizabeth Blackburn, photographer Lee Friedlander, historical theologian Jaroslav Pelikan, and jazz drummer Max Roach.